In a small bowl, combine the warm milk, 1 tablespoon of sugar, and yeast. Stir to combine. Set aside for 5-10 minutes until the mixture begins to bubble. Combine 1/4 cup sugar, butter, lemon zest and vanilla in a large bowl. With an electric mixer, beat the mixture until smooth. Add the egg and beat to incorporate. Gradually add the flour, one cup at a time, beating after each addition. Finally, add the salt. The mixture will look very crumbly, like coarse cornmeal. Stir in the yeast mixture. Continue stirring until a soft dough is formed. Transfer the dough to a floured surface and knead the dough until it is smooth and elastic, 2-3 minutes. Form the dough into a smooth ball and transfer to a greased bowl. Cover with a kitchen towel and set aside to rise in a warm place for about 1 hour. The dough should double in volume. Punch down the dough in the bowl and transfer to a floured work surface. Form the dough into a compact ball and with a knife or bench scraper, cut the ball into 12 even-sized wedges. Use your hands to roll each piece of dough into a 12-inch long rope. To form each cartocci, wrap each rope in a spiral around a metal cannoli tube. As you wrap, tuck the ends of the rope under the adjacent spiral to prevent it from unraveling while frying. Once all the cartocci are wrapped, cover them with a kitchen towel and allow them to rise for 30-45 minutes. Heat the vegetable oil in a deep fryer to 350 degrees F. Use tongs to carefully lower the metal tubes with the wrapped dough into the hot oil. Only fry 2 or 3 at a time, as you need to keep turning them in the oil so that they brown evenly. Fry the cartocci about 2-3 minutes or until dark golden brown. Remove and transfer to a paper-towel-lined baking sheet. Once they are cool enough to handle, carefully slide out the metal cannoli tubes. 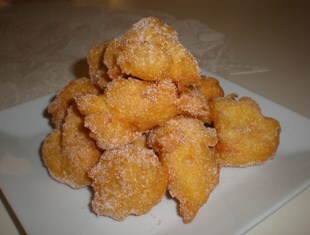 Put 1/2 cup of granulated sugar in a small bowl and gently roll each cartocci in the sugar to coat. Set them aside until they are completely cool before adding the filling. Combine the ricotta, sugar, vanilla and cinnamon; beat until smooth. Stir in the chocolate chips. 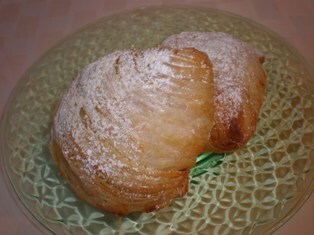 Put the filling into a pastry bag with a large plain opening and pipe the filling into the cooled pastry shells. Cartocci is a Sicilian pastry that is made by wrapping a ribbon of yeast dough around a metal cannoli tube, which is then fried, coated with sugar and filled with a delicious sweetened ricotta filling. 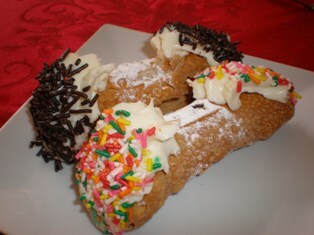 Cartocci is similar to a cannoli but with a soft, doughnut-like texture. Follow our step-by-step photo instructions. The large hard maple surface is perfect for kneading bread dough, rolling out pizza, pastry or pie dough. A 1-1/2" lip on both sides holds the board in place. Keep one side smooth for working with dough and use the reverse side as a cutting board. Made of the finest hard maple wood by Amish master craftsmen in the heartland of the US. An authentic guide to the mouthwatering sweets of Southern Italy, including regional specialties that are virtually unknown in this country.